A missing child, the gruesome murder that shocked a nation, and how the two 10-year-old killers were finally caught. On the 15th May 1976, the notorious David Copeland was born. Denise is out with James at the Bootle Strand shopping centre. It’s late afternoon when Denise makes her final visit to A.R.Tyms butcher’s shop. She places her order, but she’s momentarily distracted and takes her eyes off James. Sadly it’s long enough for him to disappear. Rushing outside she searches frantically. For Denise Bulger her worst nightmare is coming true. The police are called after security staff fail to locate him. She describes him again as wearing a blue anorak with a hood and mustard coloured lining, silver-coloured tracksuit bottoms and white trainers. At 4pm a young PC who’s carried out a thorough search of the shopping centre is comforting a distraught Denise. By 5.30pm the shopping centre closes for the day. The police launch a major search for a missing child in Bootle, Liverpool. What starts off as a simple hunt for a missing child turns into something sinister when by Friday night he’s still not been found. The police and security staff work through the night at the Strand shopping centre to sift through the CCTV footage. Their efforts are rewarded when they pinpoint James leaving the butcher’s shop earlier that day. Tracking his movements, the police search for further clues. They confirm that moments after James is seen exiting the butchers a panic-stricken Denise also leaves the shop and is seen on the ground floor hunting for her son. Unbeknown to her, James is now on the top floor and appears to be following two boys. 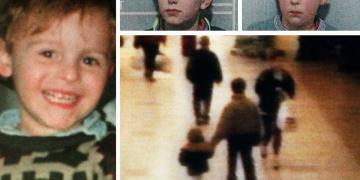 The footage reveals the haunting grainy image of the last recorded moments of James Bulger. Two boys can be seen with James, one boy is holding James’ hand. They are all heading towards the exit and the direction of the Leeds Liverpool Canal. It’s Valentine’s Day and James has been missing for two days. The police and James’ family have tried everything to find him. Patrol cars have been used with loudspeakers, press conferences have been called appealing for the two boys in the Strand shopping centre to come forward and a manhunt is underway searching the nearby canals and wasteland areas. Hope for a happy ending disappears when a young boy rushes into Walton Lane police station and announces a body has been found on the railway tracks. It’s less than 150 yards from the back of the police station. What the police discover horrifies the nation. The police have a murder to solve and two young boys to track down.